My infection is down by about 25 per cent, and I have antibiotics for three more weeks. It has been about a month now. My skin is beyond flaky - no surprises there. I have been playing with some lip and eye makeup, since foundation - and anything I cannot remove with plain water - is out of the question. Feelunique's 2015 Advent Calendar, reviewed here, included a very exciting beauty product - a Fleur De Force Eyeshadow Quad. Fleur launched these quads in two shades - Cosmic Bronze and Lunar Rose. I received the former. Scroll down for review and swatches of the Fleur de Force Eyeshadow Quad in Cosmic Bronze. The packaging reminds me of the Makeup Academy quads - basic plastic, but gets the job done. 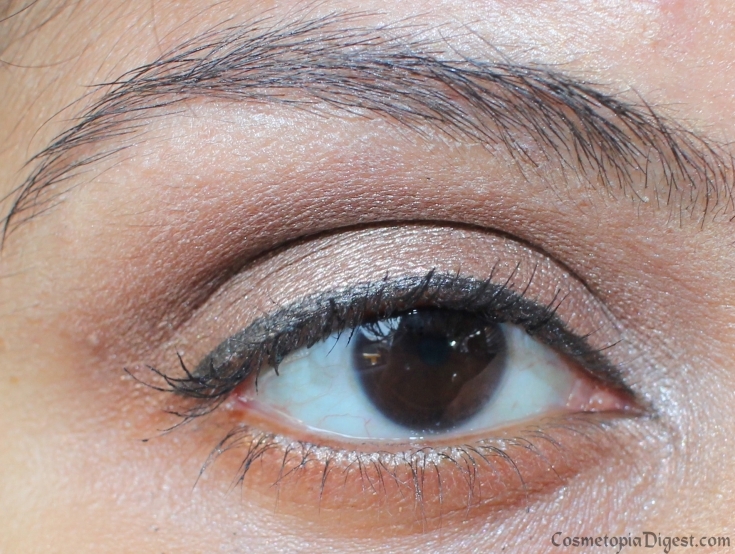 Cosmic Bronze has four shades: Coconut Cream, Taupe Brown, Mink Shimmer and Cocoa Brown. Two are matte, one is pearly, the fourth is shimmery. Lunar Rose has Baby Pink, Rose Gold, Shimmer Rose and Soft Mauve. The quad also includes a mini applicator, but it is not worth swatching with. These feel soft and creamy to the touch and do kick up a bit of powder. The pigmentation is excellent even without primer. They blend easily - as I said, these are super-soft eyeshadows. Easy to pick up a lot of colour, as you will see in the swatches below. This is with one swipe each, bare skin. The shades are universal neutrals and are ideal for subtle daytime looks - one shade actually merges better with my skintone than several of my colour-matched foundations. No, that is not chalkiness on Cocoa Brown - ignore my dry, flaky skin. I am shedding enough for 10 snakes. I'm afraid I cannot comment on staying power since I wiped them off as soon as I was done with the photo, in the hope that my dermatologist will never find out I applied makeup after she clearly vetoed everything. I've had to avoid foundation, concealer, primer, mascara (can't use makeup remover) and brow makeup. So this is just the shadows and liquid liner. Sorry, you'll have to put up with looking at my ugh-dry skin (and beleaguered expression) until I'm off antibiotics. Whether you are a fan of Fleur's or not, this is a nice handy little neutral quad that you can slip into your bag for a quick weekend getaway or a conference. The quality and pigmentation remind me of Sleek palettes, though I presume these would crumble quicker as they are softer. There are many higher priced quads (and palettes) that do not perform half as well. I can't wait to play with these shadows properly, once I am off antibiotics. At £7.99 per quad, this is not a bad deal. I will be getting Lunar Rose the next time I haul from Feelunique. You can buy this and Lunar Rose and other Fleur makeup here - worldwide shipping is free.